We don’t usually celebrate being average. 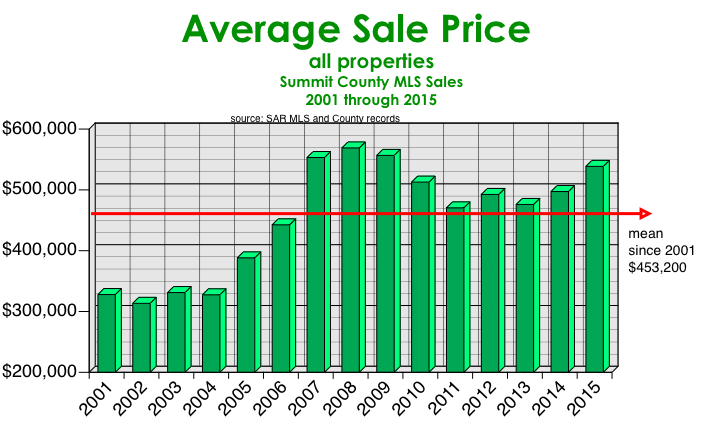 But after so many years of low performance, the Summit County real estate market finally dragged itself slightly above the average number of sales for the past 20 years. Let the celebration begin! 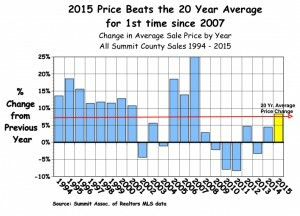 Average prices have returned to within $30,000 of the peak reached in 2008 and are above $500,000 for the first time since 2010. And all this despite the lowest number of properties for sale in 30 years. Keep in mind that there have been only 4 previous years – 2007 through 2010 – when average prices were above a half-million dollars. Only three of those years brought prices higher than those in 2015. Appreciation in 2015 at 8.3% was higher than the 20-year average price change of 5.5% per year. In a market driven by discretionary spending, where no one has to buy or sell, this is a good indication of the mood of those who can afford to own here. And it shows some optimism for future years. No one throws money at a luxury like a second home if they aren’t confident in their own future economic prospects. Even those sitting on the sidelines, who might be willing to sell after watching their investment struggle for seven or eight years, are showing confidence values will continue to strengthen. Now that they are back to even, they’re in no rush to sell. Hence the lowest number of properties for sale in decades. However, this condition could change quickly if uncertainty rises. Remember 2010? That year there were 3000 properties for sale and 1000 sold all year. Rising interest rates don’t affect our market as much as in urban markets. A lot of our buyers pay cash or put so much money down that they get the very best interest rate available. And frankly, a lot of our buyers are old enough to remember that even a 4.5% interest rate is incredibly cheap. The real beneficiaries of higher interest rates may be those looking for construction financing. Banks seem to be more interested in making all types of loans now that they won’t be locked into a sub-four percent rate for 30 years. Amazing, eh? Prices are going to continue to rise over the long term, but over the next year or two, there’s no telling. We may be at a near-term high point or this could continue for a long time. It only takes a stock market crash, recession or attack to cause people to tighten up. But this extremely low inventory will not last. As prices rebound and owners’ priorities change 2016 will bring a higher number of sellers into the market. The question is will there be enough new listings to cause prices to stagnate? If you were waiting for prices to rebound to where you bought, your time is here or very close. If you are waiting for the next crash to buy, hope you brought a book. It could be a while. OK, so you’re under contract to sell or buy a home with about 3 weeks until closing. 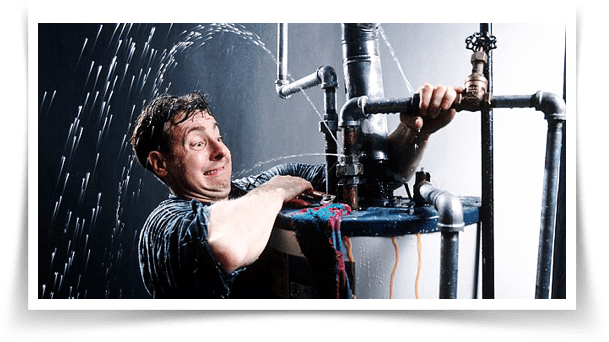 It’s mid-December and your broker calls to say that a pipe has frozen and burst in the property and there is water damage. What does this mean to you as a buyer or seller? Well, the contract covers this. Section 19 states that if the amount of the damage is under ten percent of the total purchase price, the seller is obligated to repair and restore that property. The buyer can terminate the contract only if the repairs are not done by the closing date or if the amount of the damage is over ten percent of the price. If you are a seller, this is where your Realtor earns his money. He needs to get contractors in to dry out the place, mitigate any mold, have the drywall tested for asbestos before the demolition, supervise the work, yell at vendors who lag, and get all this done, assuming the buyer won’t grant an extension, before the original closing date. I end up as the general contractor for the repair project several times each year. Marketing and bringing you a contract is the easy part of the deal. As the buyer, your Realtor still needs to actively supervise and advise you of the extent of the damage, progress of the repairs and likelihood of closing on time. So you can go with a cheaper Realtor and do all this yourself by phone from Omaha, or you can list or buy with me and know that we’ve got it. See, it’s not as easy as we make it look, is it? The Slifer, Smith, etc. Summit Daily ad from December 26, 2015 shows how much real estate each of the six largest companies closed in 2015. Never mind that it was still a week before the end of the year. The latest roster of Summit Association of Realtors membership shows the number of brokers working at each of these companies. Simple math does the rest and, voila, we see how much volume each company’s brokers averaged. And it’s shocking in a couple of ways. 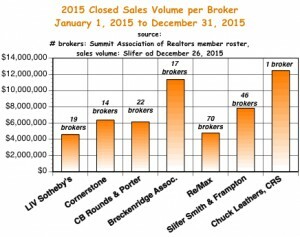 Re/Max has 70 brokers and averaged less than $5 million per. 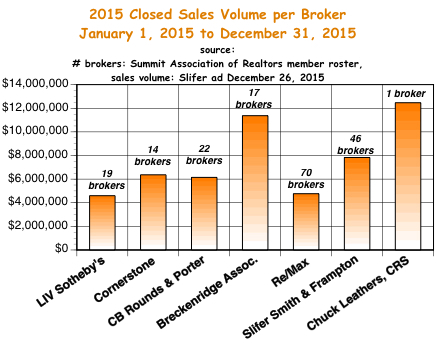 While Breckenridge Associates with only 17 working Realtors averaged over $11 million per broker. So am I NUMBER ONE!? Well… probably not. But this goes to reinforce what I tell customers every time; you aren’t hiring a company, you’re hiring an individual real estate professional. Mr. Re/Max isn’t your broker, Bonnie Broker who happens to work at Re/Max is. She’s the one who will either have the expertise and experience to price your property correctly and sell it as soon as possible for the best price possible… or not. I’m closing in on 1000 career sales worth about $200 million. I have help, my invaluable assistant Emily Caldwell, but I’m the one worrying about getting your property sold or finding you the right one to buy. And then I’m the one losing sleep over getting the closing done on time and with no nasty surprises. Maybe I should take out that full page ad. Nah… more people read my newsletter than those ads. 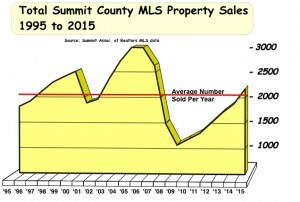 There’s a housing crisis in Summit County. Never before have so many renters sought after so few homes. 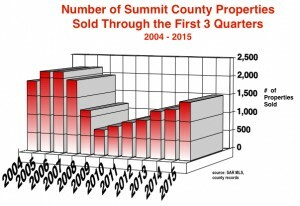 At the end of December there were a total of 3 residences for rent in the Summit Daily News and the seasonal migration of workers to Summit County had not peaked. 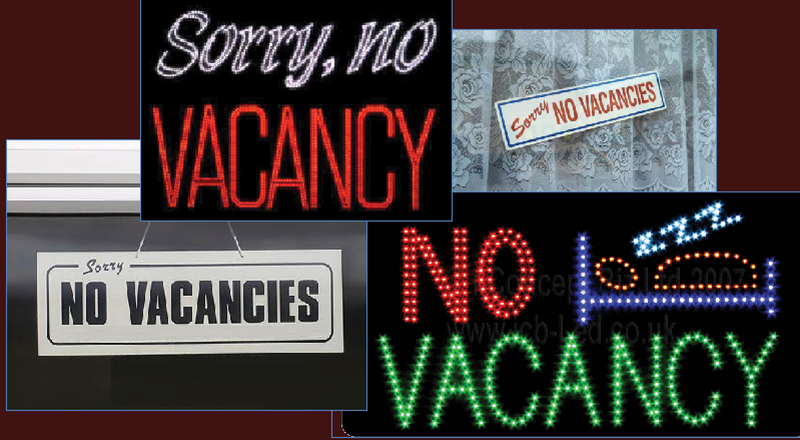 Unfortunate lodging seekers are being caught up in Craig’s List scams left and right. 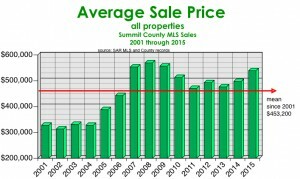 Every Realtor in Summit County is getting calls asking if their listings are for rent or checking to see if the Craig’s List posting is for real (it usually isn’t). In December Vail Resorts narrowly avoided an employee mutiny. They announced that, due to the lack of rental space, bunk beds would be installed in employee housing. The battle isn’t over, there still may be a strike. Historically, the overflow of renters moves to Leadville, Fairplay and Kremmling. Rents are much lower, but the 80-mile round trip drive soaks up the savings. This year those small towns are packed as well. Two bedroom units in below average condition and location are renting for $1400 to $1600 per month. Nice units go for well over $2000 in Frisco and Breckenridge. Homes and duplexes are even more expensive. Sale prices for these units reflect this shortage. A year ago you could have bought a Dillon Valley East two bedroom for under $140,000. Today it will cost $185,000. And at these prices, renting still doesn’t do more than break-even except for cash buyers. So a lot of these units are being bought for cash. That takes affordable housing ownership away from locals who can’t pay cash and pushes prices higher than they can qualify for. The theory that second homes being rented to vacationers causes the rental shortage is hogwash. More than half the second homes in Summit County are never rented and of those that are many are rented long-term to local residents. Several HOA’s have limited rentals to 30 days or more. With no short-term allowed, more long term rentals have been added to the pool. The main cause of the housing shortage is population increase coupled with lack of vacant land. Don’t expect either of these factors to change much in the future. Every resort area is facing this problem. Tourism is now, by many accounts, the largest industry on earth; possibly bigger than energy, manufacturing, and tech combined. It’s not going away. So… that’s why I own rental property. They’re not forest fires any more, they’re WILD FIRES (be afraid, be very afraid…). Likewise, it’s not just a big storm any more, now it’s a SUPERSTORM!!! And we have to give them names, too. As in the recent headline: “Winter Storm Echo (How did I miss Alpha through Delta?) drops close to a foot of snow.” Guess the Weather Service needed to jack up the hype to stay relevant. CDOT goes back to the future… once again requiring adequate traction on Colorado highways during snow storms. The State Legislature finally passed a “freedom-limiting” law requiring snow tires or chains for passenger vehicles during storms. The nerve… When the Rumor Monger first moved to Colorado, the cops would stop you at Georgetown and Vail to see that you had good tires or chains. Only took about 30 years for common sense to prevail again. Colorado women rule the FIS ski racing circuit… between Mikaela Schiffrin and Lindsey Vonn the rest of the world might as well go home for cocoa. Vonn has just become the winningest World Cup racer in history. And Schiffrin dominated the slalom last year and won two slalom events this year before injuring her knee in December. The guys meanwhile are busy dodging drones on the race course. And speaking of drones… Colorado ski resorts are either banning them or limiting use to specific areas of the hill. Really guys, toy airplanes? Learn to fly real aircraft and stop being pilot posers. Which do you think is more impressive in the bar: “I fly helicopters in the Arctic”… or… “I fly drones from my lawn chair”? Just sayin’. Summit County hasn’t quite arrived yet… we aren’t even rated on the scale of snobbiest Colorado towns in a recent list by something called RoadSnacks.com. Aspen only came in 3rd with Vail second. Aspen did take top ranking on the list of drunkest cities, however. Looks like we’ve got work left to do, folks. It seems like “the good old days” have returned: lots of buyers, prices increasing, a comfortable feeling in the air. My experience shows that when life looks like easy street, there is danger at your door. This time it could be recession, a nasty election, stock market lurches, attacks… who knows? But for the moment it’s nice to just enjoy the present and know that you’ve planned for the worst if it happens. Thanks for your business. It has made my plan come true. Call me any time about your plans. I can help. 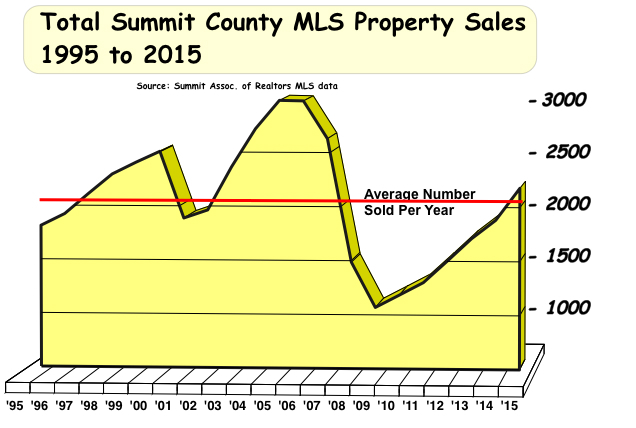 After seven years in the wilderness, the Summit County real estate market is just now approaching “normal”. This year the number of closings will return to the 20-year average and the average sale price will be near the historic peak. After a relatively slow July when sales only equaled the average number for July and fell short of the number sold in July 2014, it appeared outside forces might derail our best year since 2007. It’s still not clear if that will happen, but as of October 1, activity has not dropped off very much. If the tea party doesn’t shut down the US government again and the stock market only swings 1000 points per week, we may get out of this year in fair shape. Through the first 3 Quarters of 2015, 15 percent more properties had sold than in 2014 to date. August alone brought 11 percent more sales than last August. The market is on pace to sell 2200 properties this year, about 150 more properties than the 20-year average. That would be the first time it has reached or exceeded the average since 2007. Make no mistake, about 700 more properties must close in the 4th Quarter and if the market stops cold, that won’t happen. With about 300 properties under contract waiting to close, however, a big part of the job is done. Prices have been recovering as well and the average price is now over $530,000 for the first time since 2010. The average of $535,000 is only about $34,000, or 6 percent, lower than the peak average of $568,971 that came in 2008. 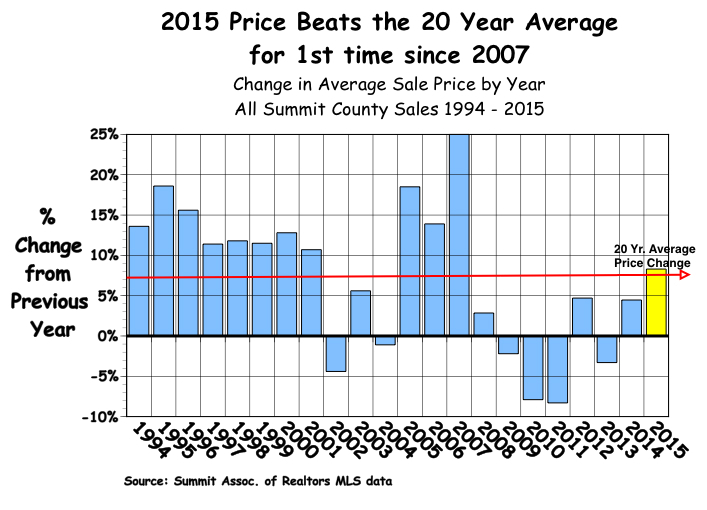 More generous appraisals and many cash sales have allowed prices to rise faster beginning in the 3rd Quarter. Cash sales create higher priced comparable sales than a lender would allow if an appraisal were required. Once a property, in a complex of town homes for instance, sells for a significantly higher price than previous sales, the entire complex has a comparable sale to point to for the appraisal that might be needed. Lenders are slowly returning to the mortgage market as interest rates increase. When we ask why they are just now getting back into the mortgage business, it’s been a hoot to hear them protest that they never left! Residential properties are selling for an average of 96.6 percent of list price and taking an average of 175 days to sell, about 8 percent faster than last year. The last time we saw sales this close to list price was about eight years ago. 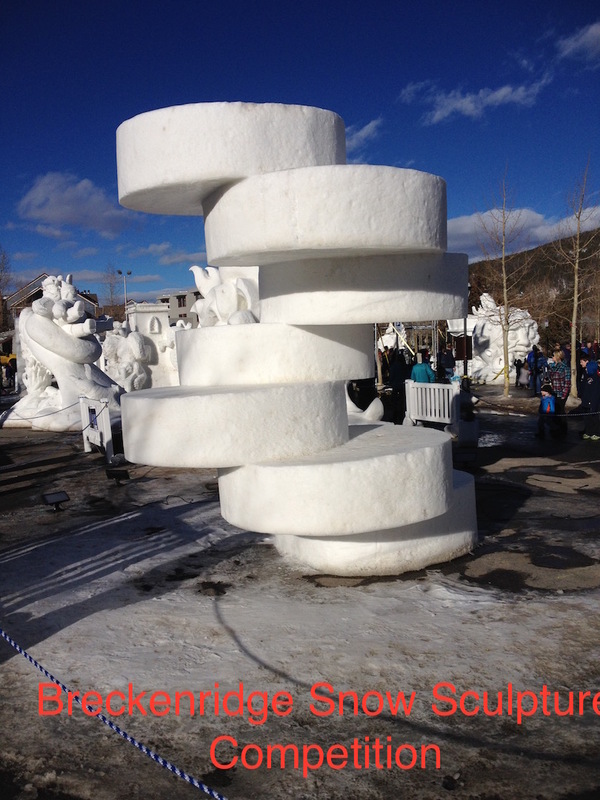 Breckenridge averaged the highest price per square foot in Summit County at $421. Wildernest/Silverthorne averaged the lowest at 267 psf. 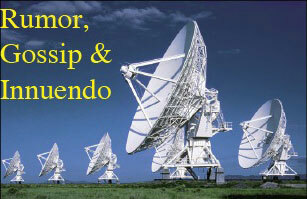 Properties sold fastest in Dillon taking an average 123 days while Copper averaged the most days on market at 397. 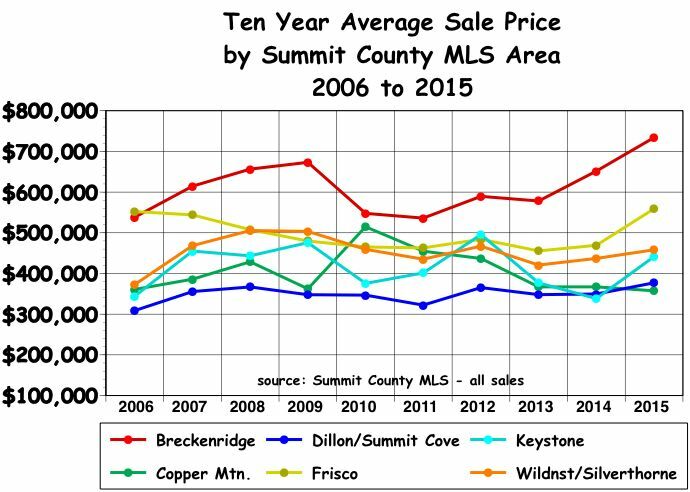 Frisco prices averaged 97.6 percent of list, the highest in the County while Copper Mtn. averaged the lowest at 93.9 percent. 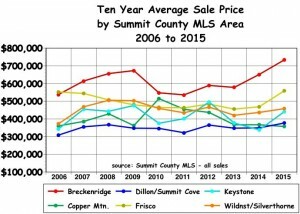 Overall, Breckenridge average prices were the highest in the County at $734,000, Copper Mountain averaged the lowest at $357,400. Frisco was the second highest, Wildernest/Silverthorne the third highest beating out Keystone at number four and Dillon finished at number five. Keystone showed the greatest appreciation rate increasing by over 30 percent from 2014, after having the lowest average price in the County in 2014. Frisco came in second with a gain of about 20 percent after about five flat years. The most interesting development is an inventory that continues to decline from already historically low levels. At the beginning of October, just over 1100 properties were on the market. A normal number is more like 1700. Owners who bought in 2008 or so are continuing to wait for a return to the prices they paid for their properties… plus some profit. That means about 5000 owners who would normally be getting ready to sell after the typical number of years are holding off. Others who want to move up to another property won’t sell before they find a replacement. With nothing for sale, that is difficult. Hence a log jam of pent-up seller activity. As prices increase, this situation will sort itself out. The long slow climb back to normalcy continues.